My home network is made up of single desktop machines, running Debian GNU/Linux, and an EEE PC laptop. The desktop machine is on all the time, and the laptop is primarily used when I want to sit in front of the TV and work, or in bed! It was purchaed around 9th March 2010, from Novatech. This is a low-end EEE PC. My internet gateway is an 8 port Linksys FEFSR81 router, it is small, quiet, blue, and mostly reliable. The machines are setup as a flat C class network, or in CIDR notation a /24. Virtual machines running under KVM. 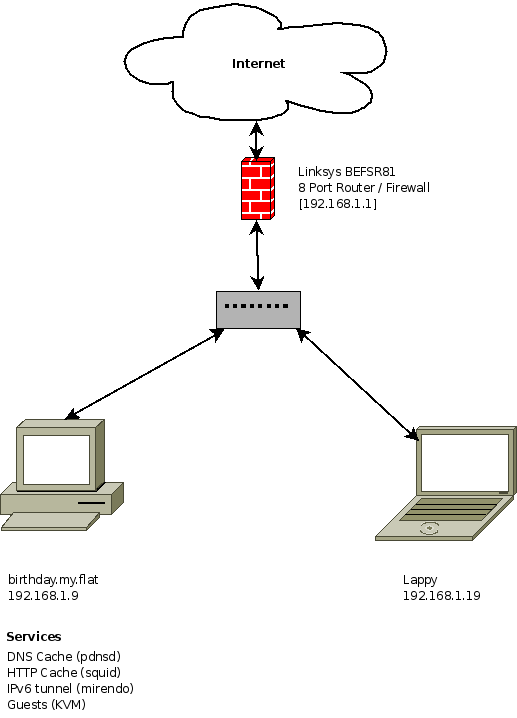 DHCP leases for guests/random use.